My brain is constantly clanging around with recipe ideas. Sometimes they are inspired by dishes I’ve seen in restaurants, in magazines, or on other blogs, but sometimes I get a name in my head for a recipe first. Pestachio. It’s just fun to say! But, don’t worry. I wouldn’t post it if pistachio pesto wasn’t also awesome. 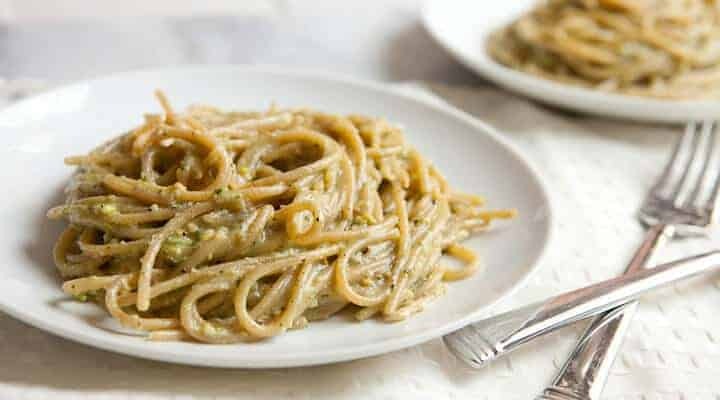 If you can imagine a pesto that is somehow a darker, deeper green than one made with just basil and has a richer flavor, this pesto is that. Of course, there is the shelling issue. While you can buy pistachios pre-shelled, I don’t mind the work and find it a bit meditative. Plus, I reward myself with one pistachio for every four that I shell. My easy recipe for pistachio pesto (Pestachio). The hardest part is the shelling, but it’s totally worth it. A new twist on pesto! 1) Shell pistachios. If you have any stubborn ones, you can use a half shell from another pistachio to pry open the shell. 2) Add nuts to a food processor with basil, mint, and minced garlic. Drizzle in a few tablespoons of olive oil and pulse until the mixture is a coarse paste. 3) Drizzle in rest of olive oil until pesto is a good consistency. There shouldn’t be any lumps, but it doesn’t need to be completely smooth. 4) Remove pesto from food processor and season with salt and pepper. 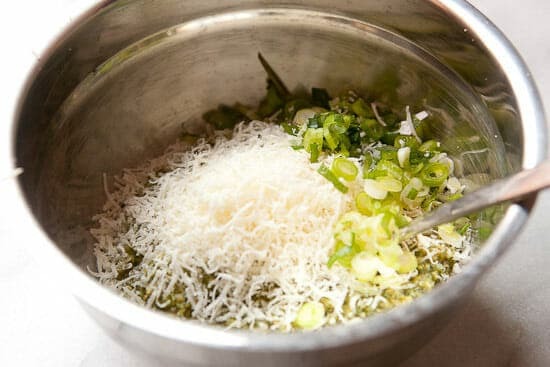 Stir in minced scallions and Parmesan cheese. 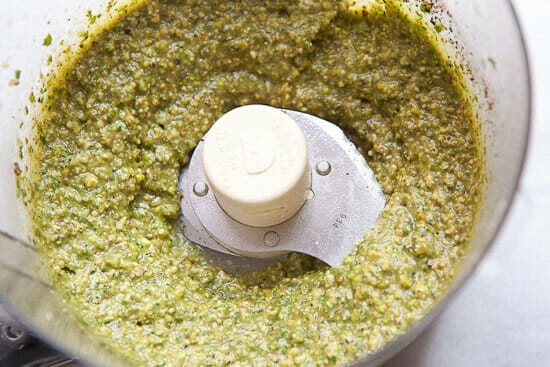 Store pesto in the fridge for up to five days. To use it in pasta, it’s best to warm it in a pot with some hot pasta water to loosen it a bit. Then stir that mixture into the hot pasta. You want about six ounces of pistachios for this recipe and that is roughly a cup of shelled pistachios. 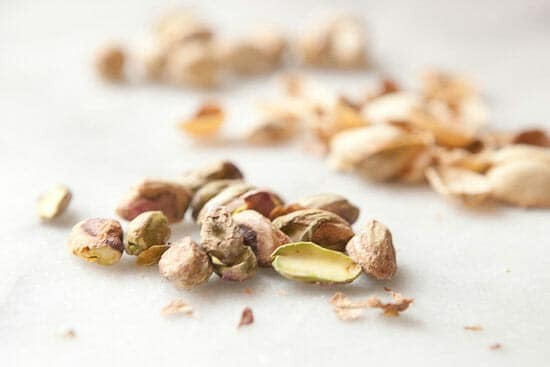 If you’ve never shelled that many pistachios, it’s an almost impossible amount to reach because when you get about half a cup, you will find yourself eating as many as you shell. It’s a never-ending cycle. Just make sure you have enough pistachios on hand to do the recipe and snack! One tip: If you have a stubborn nut, you can use the half of a shell from an already shelled pistachio to pry open the stubborn one. Works like a charm! 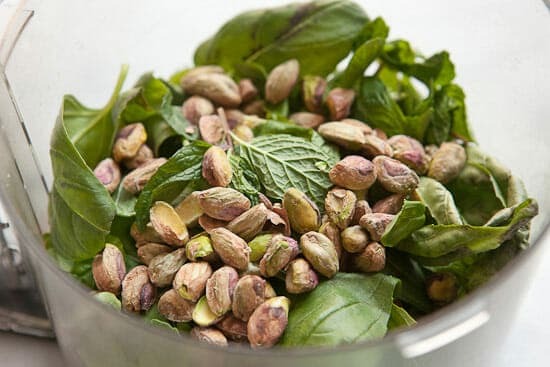 Once you get enough pistachios to measure out a cup or so, add them to a food processor with the basil, a clove of minced garlic, and some mint. The mint/basil combo is another nice little touch. You could use all basil if you wanted, but I really like the mint. A little goes a long way. Add enough olive oil to make sure the mixture can form a coarse paste. Then you can add the rest of the olive oil in a slow stream as the mix processes. This was my finished pulsed pesto. It looks good, but we have a few more add-ins to go. Besides a big pinch of salt and pepper, the pestachio will benefit from some cheese (parm is always a good bet) and some mild onion flavor. Instead of processing these things in though, I like to stir them in so the pesto has a little texture to it. The finished pesto has a beautiful color. If you’re storing it for later, add a drizzle of oil to the top of it which will keep it fresh. I just love the dark green color. You can use the pestachio in pretty much any recipe that calls for pesto. It has such great flavor though, I think it’s best served with pasta on its own. The key to making this really shine is to cook your pasta and reserve about 1 cup of salty pasta water. 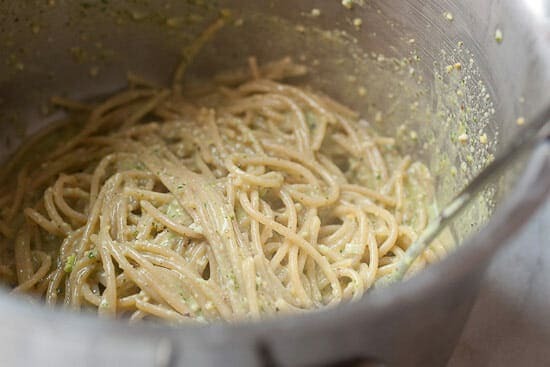 Then heat your pesto in a separate pot over medium-low heat and add enough reserved, hot pasta water to loosen the pesto a bit. It should almost turn into a creamy sauce. Then toss your hot, drained pasta right in and stir it all together. The little bit of pasta water will make everything come together. You need nothing else on this pasta. It’s delicious just like this. Pile it high and dig in! 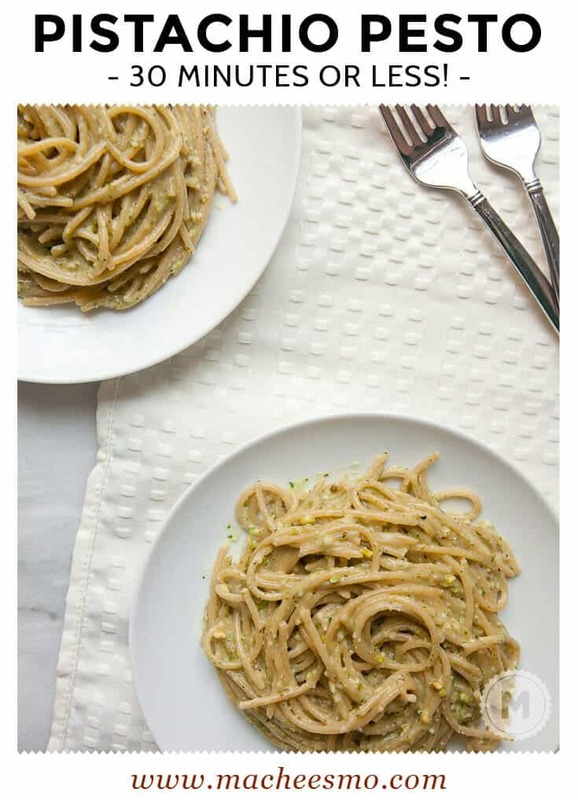 Love this twist on pesto! 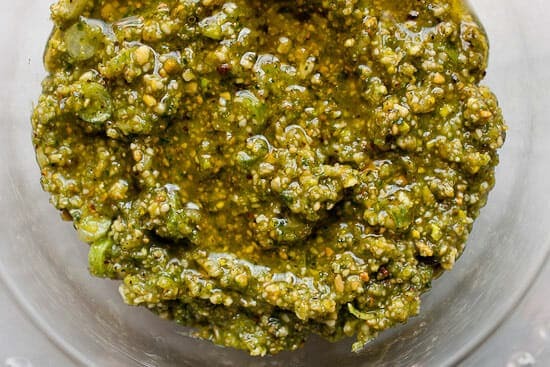 I’ve never tried pistachios, but last weekend I made arugula pesto (great for using up way too many greens you know will go bad before you have a chance to eat them fresh) and froze it for later. Your “pestachio” version sounds amazing, I’ll have to try this next. Pestachio is sooo fetch. New go-to word. Oh… and this looks delicious, too! Wow- what a brilliant idea to use pistachios!